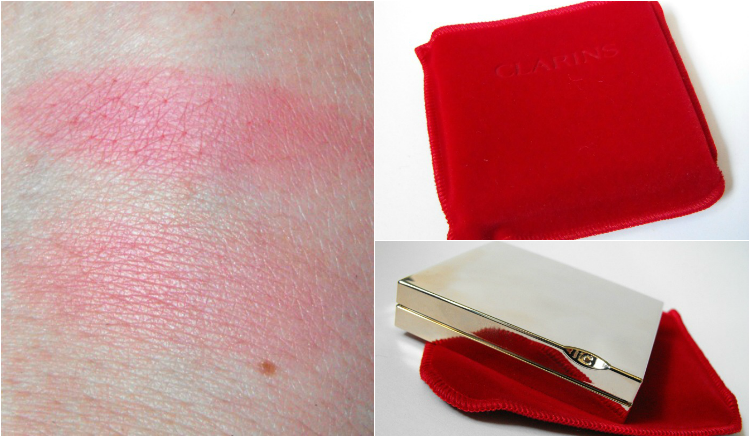 Sophsterlicious • UK Blog: Clarins Illuminating Cheek Colour - Miami Pink. This is one of the first products I have ever tried from the Clarins brand. The Illumination Cheek Colour in Miami Pink*. It's already love! I have become a bit of a blush (and lipstick) a-holic recently and they are all I crave makeup wise. This product is packaged beautifully with a red velour pouch. The outer blush packaging is shiny and gold and gorgeous (and loves finger prints!) It has a nice large mirror on the inside .. Once open you're greeted with a gorgeous blusher, a couple of different shades that you can swirl together. The brush applicator that is inside is soft, but I won't use it.. I prefer something large and long handled to apply my blusher. The shades are so pretty, I like best to mix them, but I swatched them seperately above, they are not over shimmery, but there is the slightest glow in there that shows when you apply the colour to the cheeks. It gives a really healthy look. The shades in the blush are a peach and a pink, so when swirled together they give a nice pink flushed shade that has a hint of peach.